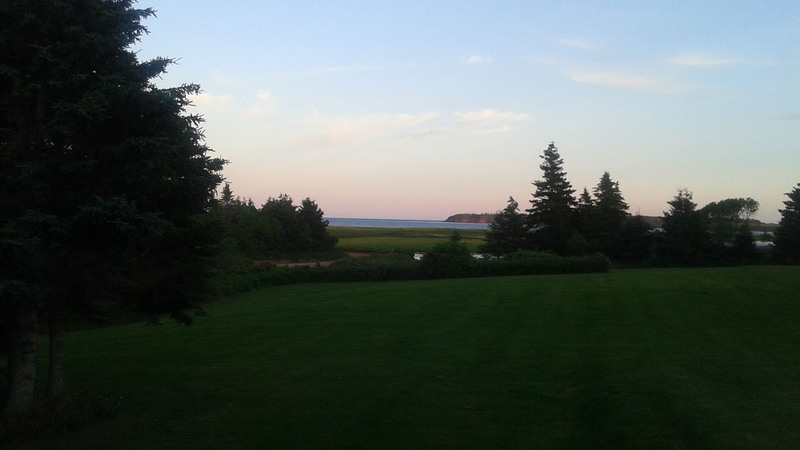 I started my first morning on Prince Edward Island, a beautiful sunny day, by finding a yoga mat in a cupboard here I was staying and practicing yoga outside on the deck in the morning sun! Then shopping for food with Marion in Souris, 2 small bags cost $69, food is expensive in PEI, as most everything is shipped in. 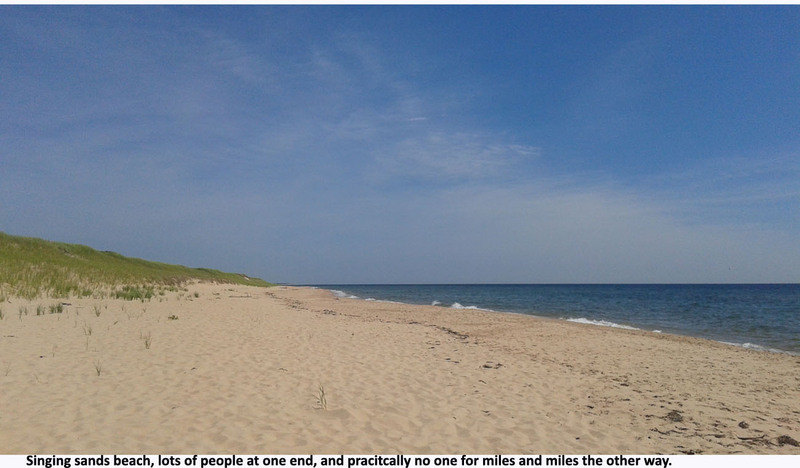 I went down to the very quiet beach for a few hours. Marion and Paul (who lived 2 doors down) asked me if I drove standard, yes I replied, and they offered to lend me their car to see the sights! Wow! I decided to stay 3 more nights, to travel up and down the east coast. The sun sets with a purple sky over the ocean view as the cliffs turn red. Night time view from where I was staying. Another relaxing day, I drove to the eastern point of the island and then down to spend the afternoon on Singing Sands Beach. The sand squeaks as you walk on it. 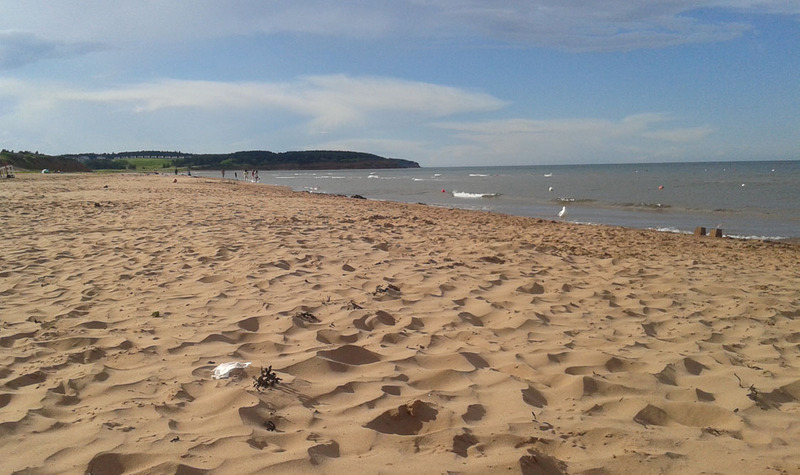 It's busy in one spot, but easy to find a quiet place away from the crowds as the beach goes on for miles. 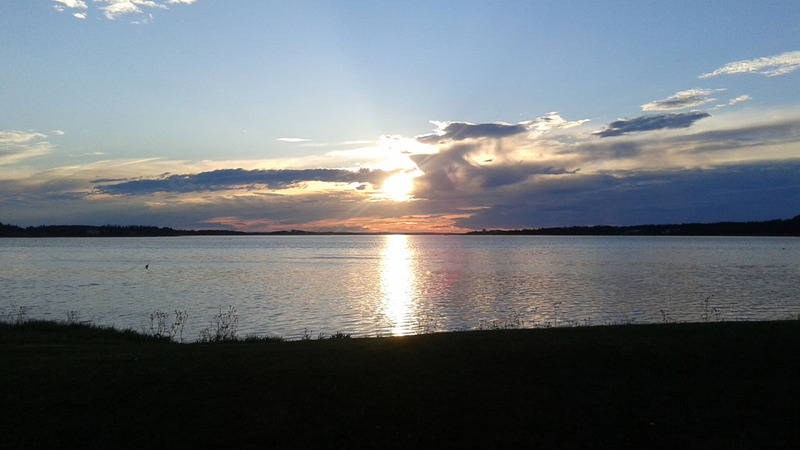 Another beautiful sunset view from my home, but the mosquitoes were fierce so I couldn’t sit outside. I gave my bike a well needed cleaning, the rain on the Cabot Trail had splashed dirt and grease all over it. 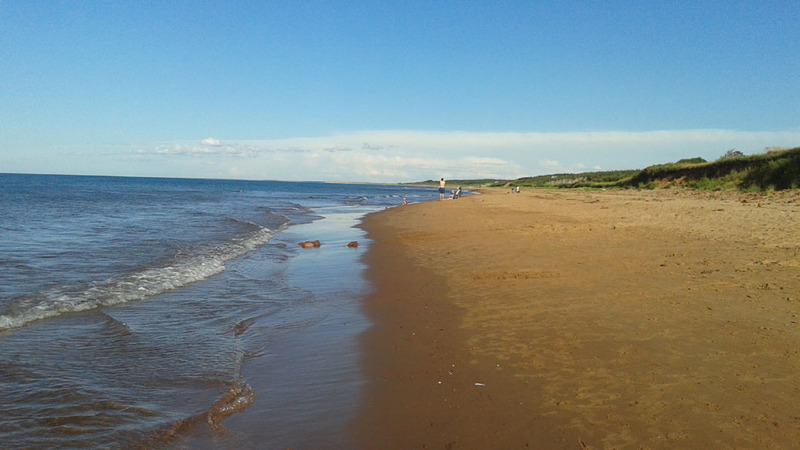 I drove out to Panmure island and the provincial park beach there. 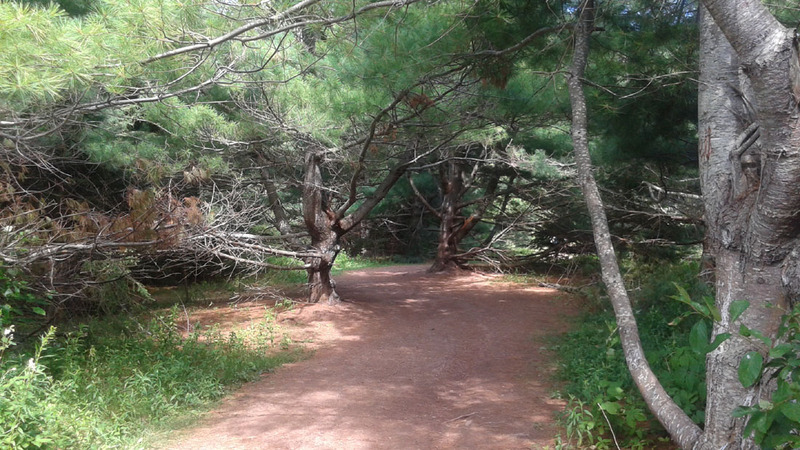 Then onto Bradnell provincial park. 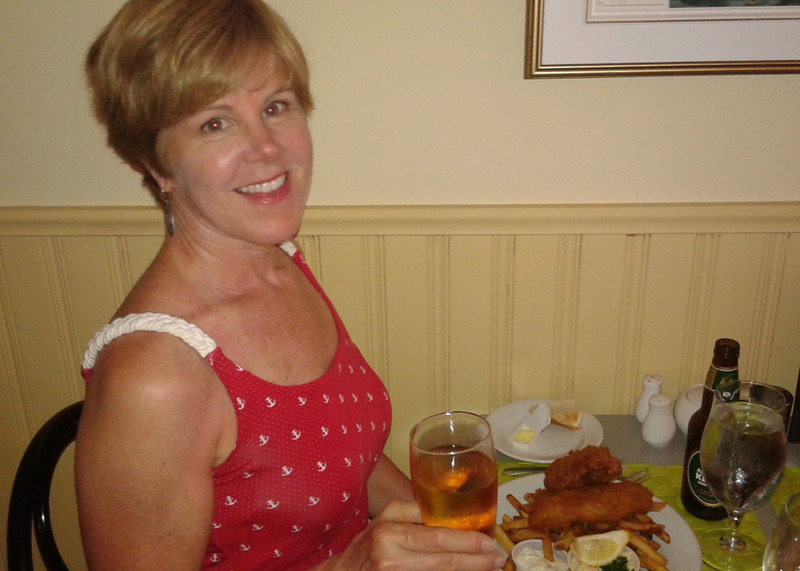 Dinner in Georgetown some fish and chips and a beer! At 8 PM I went to see the local talent at a Ceilidh, pronounced Kaylee. But unfortunately it turned out to be some rather elderly men playing the guitar and singing “On top of Old Smoky” and other songs quite off tune and some people dancing. The couple from Boston I was sitting with said that they had seen some very good Ceilidhs, (not this one!) I left early. After 3 days of rest I was eager to be back on my bike! Paul had offered to drive me to St. Peters about 30 kms away, No, That’s ok, I’m here to bike! I left at 9:15 and I quickly realized that when I had cleaned my bike I had wiped off the sensor magnet attached to my spoke. This meant that my odometer no longer worked and that I wouldn’t know how far or how fast I had traveled, I could simply estimate. I figured it went well with the laid back P.E.I lifestyle. 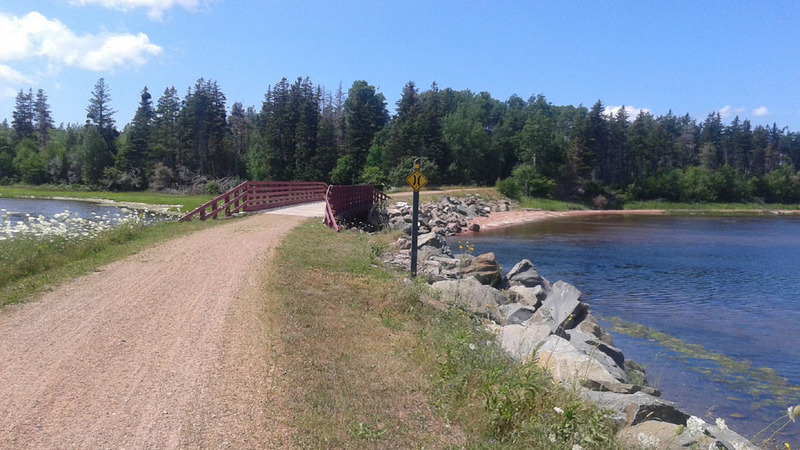 At St. Peters I left my heavy bags at tourist info and rode my bike to the floating boardwalk about 10 kms away. 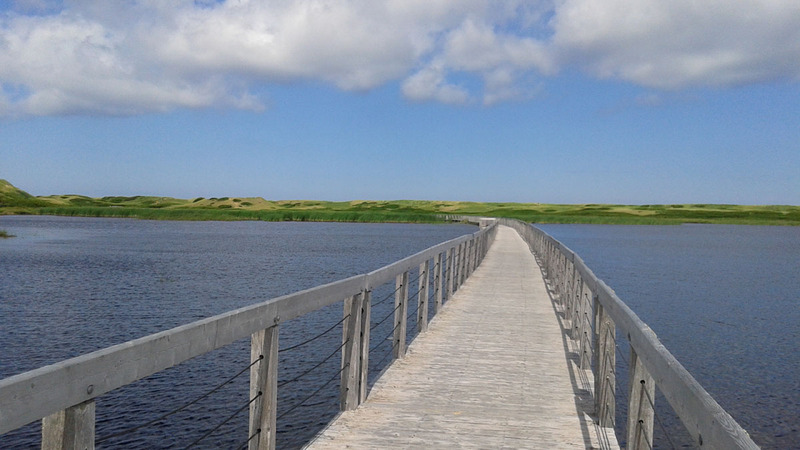 I was glad to be able to ride my bike along the long path through the woods to the board walk and along the boardwalk as it was quite far. 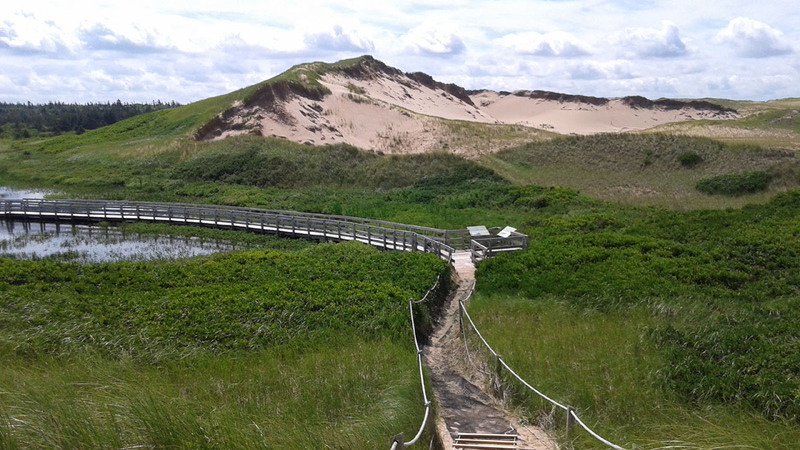 A beautiful place with gorgeous big sand dunes, I was so glad I went. 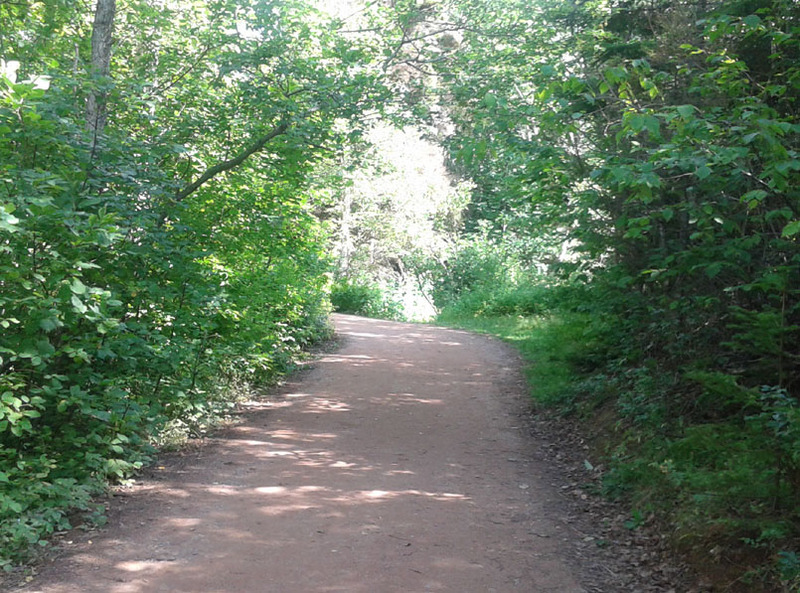 I continued my ride along the Confederation Trail -train tracks made into a bike path. 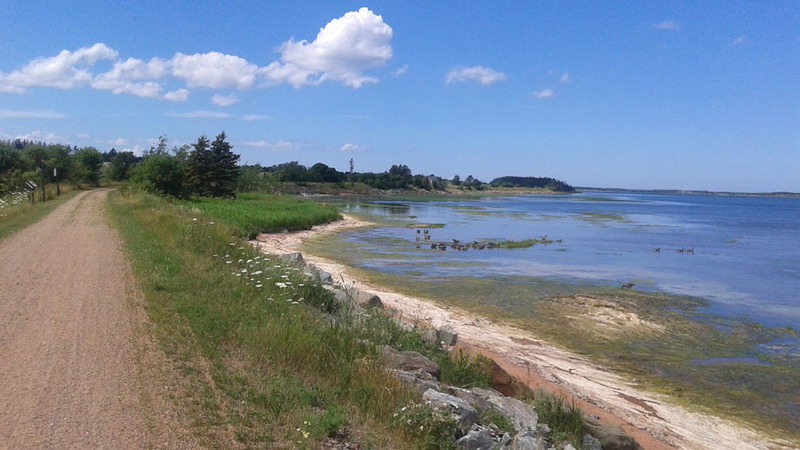 It was very scenic along the river, perfect for bicycle touring pictures, although quite loose sandy gravel in some places. This made the going rather slow and treacherous as at any moment it was like riding in deep sand. A tire could slip out and you’d go down! I cursed the person who had dreamed up this kind of a trail, or why they couldn't fix these stretches to a harder packed surface. 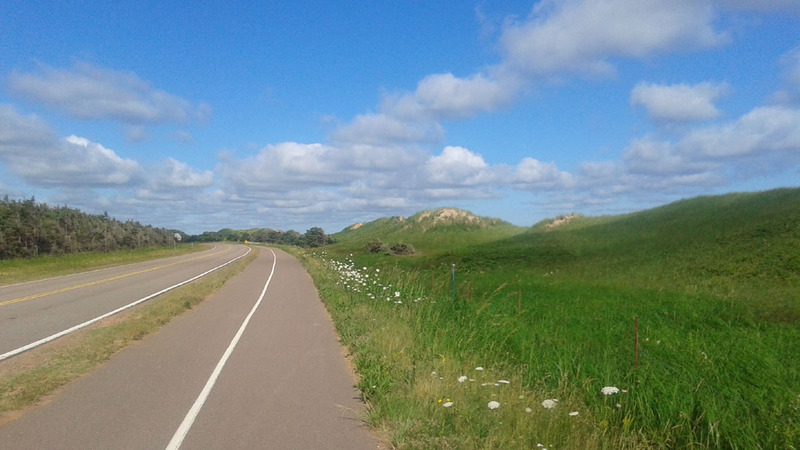 I tried to gain speed on the more hard packed stretches, but I constantly gripped my handle bars in fear of the loose sandy stretches, not exactly the kind of adventure bicycle tour I had planned on! At one point I stopped to rest and stretched out completely flat on my back in the grass to ease the aches and my tired body. 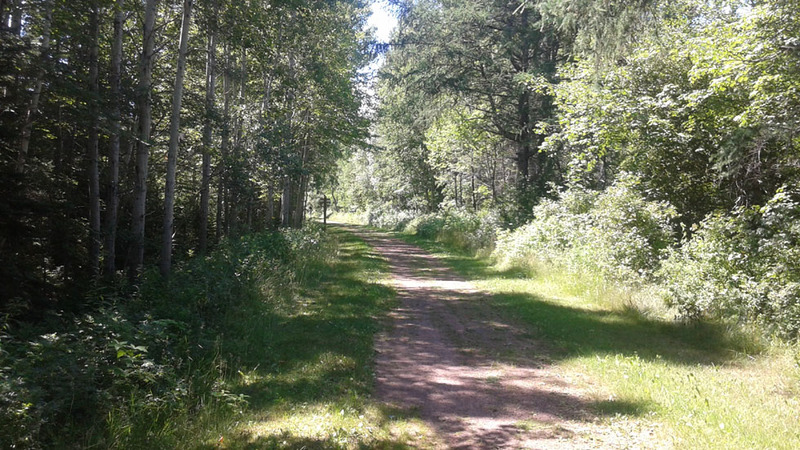 After 42 kms on the trail I turned off onto paved roads. As I immediately picked up speed I thought that being on the roads I would've been able to cover a lot more distance, oh well. 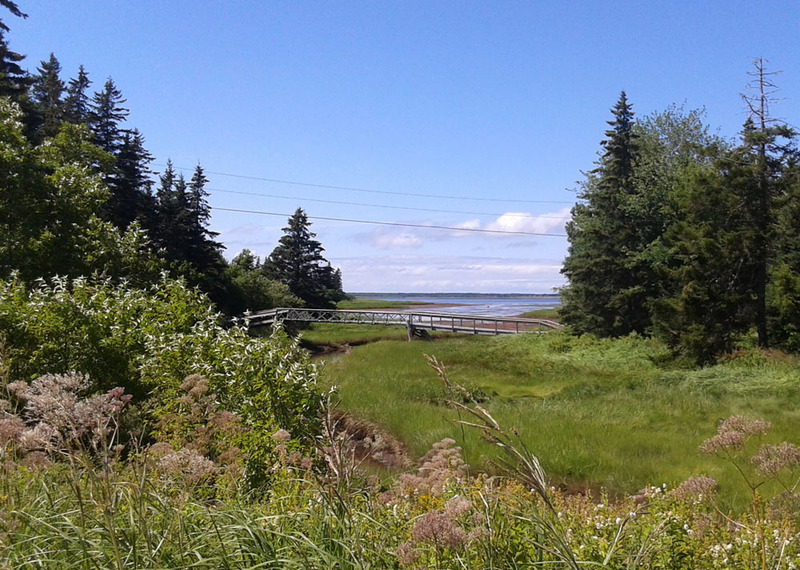 I had hoped to make it all the way to North Rustico Harbour but I realized it was too far. I could make it to a campground. Which I did at Stanhope. 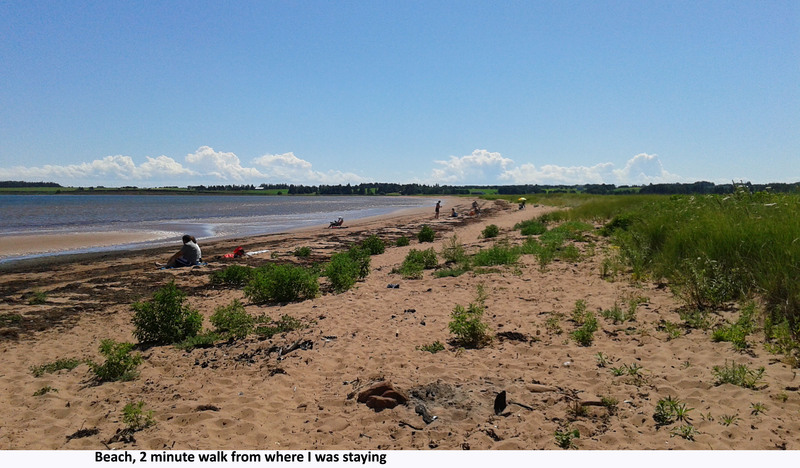 With the beach on one side of the road and campground right across the street, it was ideal! After my trip, I was reading a cycle touring blog that suggested always carrying at least one extra meal. I still had some things to learn about cycle touring, I only had some snacks. The only restaurant was 7 kms away I was told, no real stores anywhere close. Back on the bike to go for dinner! 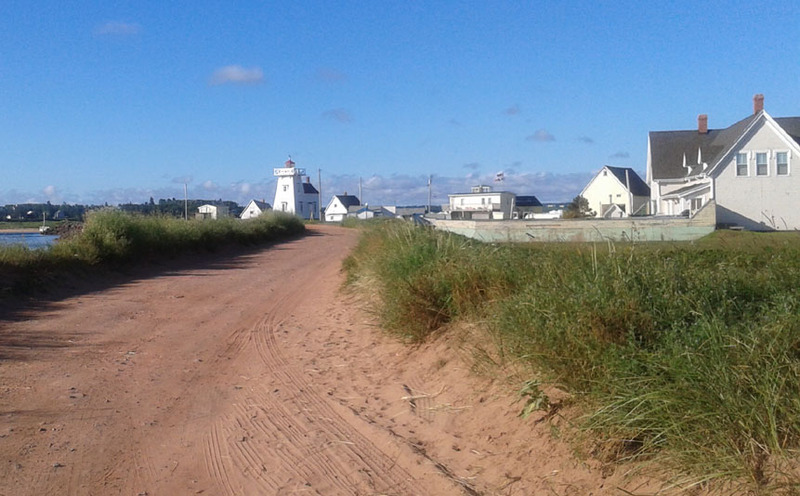 The bike path followed the sand dunes and beach the next day as I made my way towards North Rustico Harbour. I stopped in a little café and went around the back to see if I could find a place for my bike. 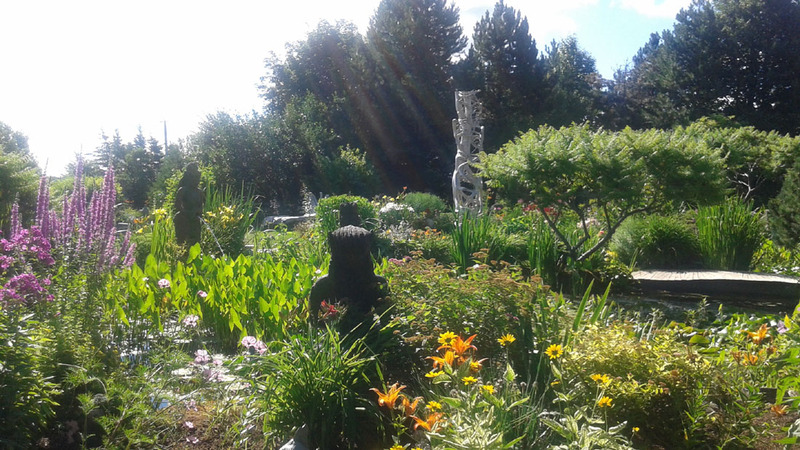 I came across the most beautiful garden, part of the art gallery beside the café. It was filled with carved furniture, and imported statues of Buddha, Ganesha and more, a beautiful oasis. I followed the street numbers finding the address of my first couch surfing host. 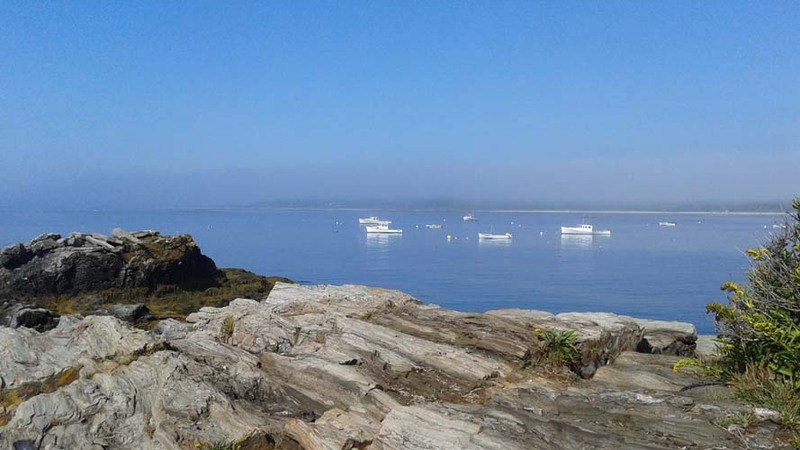 Blaine’s house was the 4th from the end of the point, a stunning location with ocean and water views from 3 sides! 3 doors down a light house built in the 1850s, a beautiful quiet beach 2 minutes walk away, how perfect! 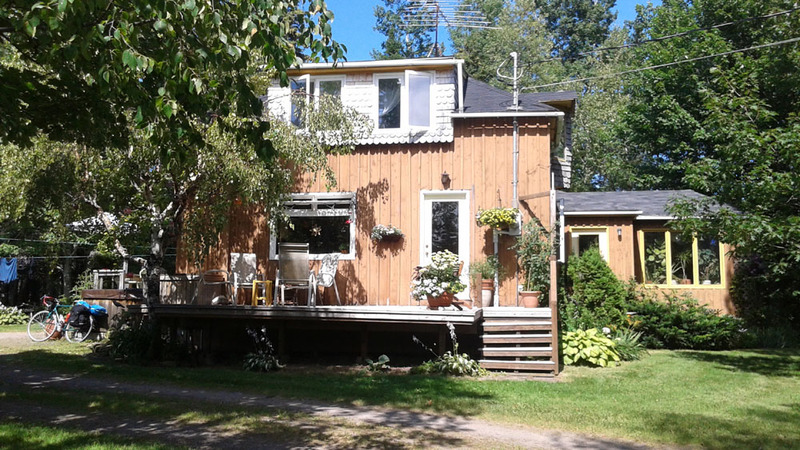 The house was built from a 100 year old barn that had been taken down, and rebuilt in the same shape as a barn. 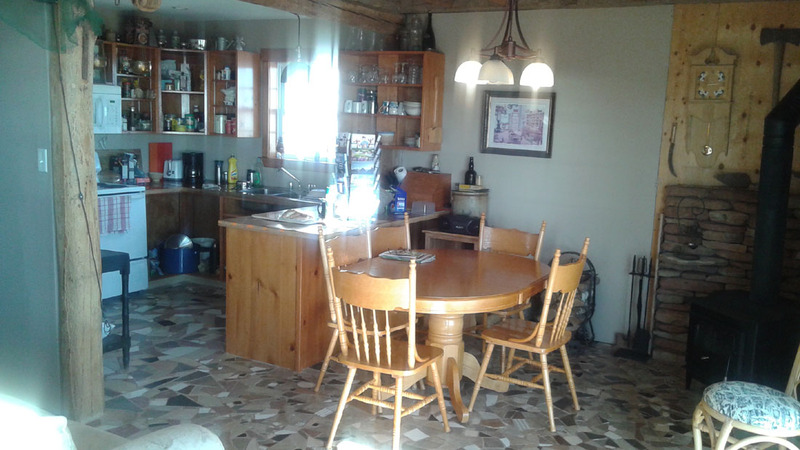 100 year old hand hewn logs inside, tiles of various sizes put down as a floor. Worm-wood beams as part of the support beams for the upstairs loft. Wood burning stove in the corner for heat in the winter. So quaint! 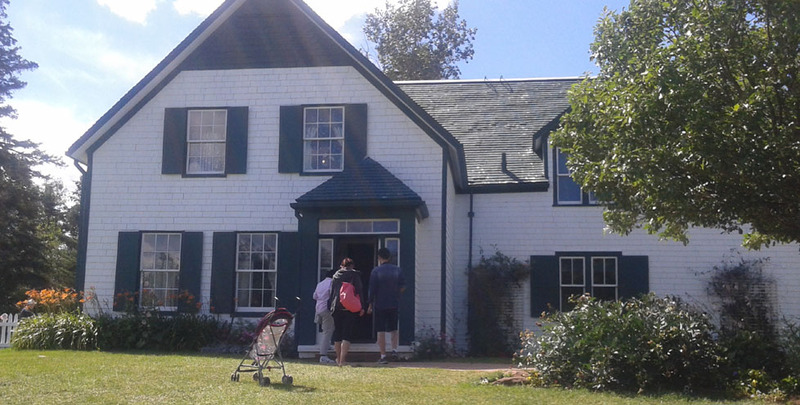 I unloaded my bike, had lunch at the Blue Mussel Café and rode the 9 kms to Anne of Green Gable’s house! There was a short movie to see before viewing the house and grounds and I had tears in my eyes to hear the story once more, about how L.L. Montgomery lost her mother and was adopted by her rather cold and uncaring grandparents. The story of Anne of Green Gables is somewhat autobiographical, Anne was raised by Marilla and Matthew who had trouble showing her their love. Interesting to note that Montgomery had tried 5 times to get her book published and had given up for 3 years, before finally pulling it back out and getting published in 1908. 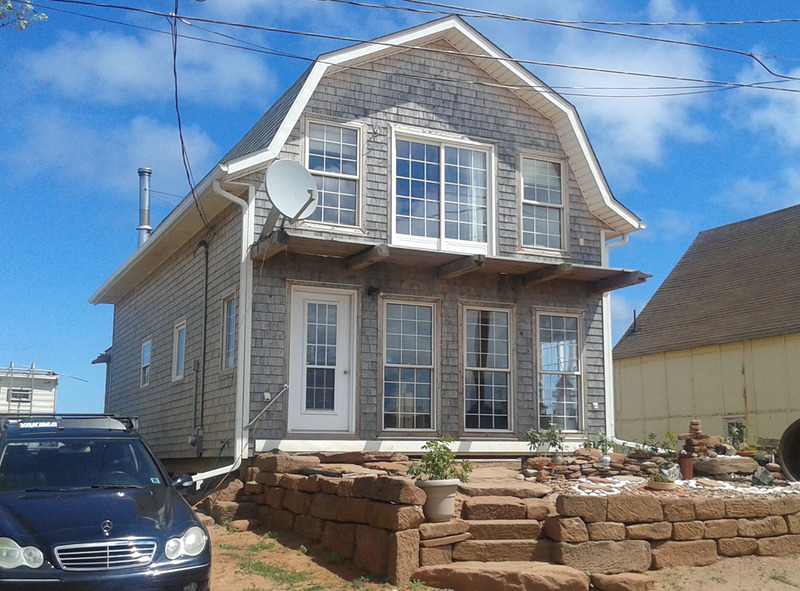 Back at Blaine’s, we chat and I get to know about life growing up in the harbour. I decide, I must stay another night here in this gorgeous place and simply have a longer day of cycling when I leave. I have my own nice room with double bed. Couchsurfing doesn't always mean you sleep on the couch! 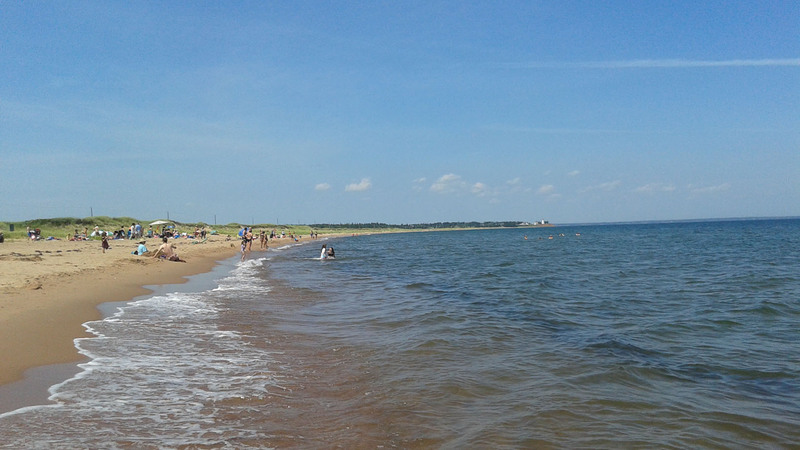 A beautiful, relaxing day at the beach, I buy a cooked lobster at the fish market for lunch. Blaine and a neighbor, visiting from Toronto, decide to take a ride to the provincial park to watch the sunset, I agree to go along. Beautiful area with cliffs where he sometimes takes his boat and anchors it, to enjoy the fish he has caught for dinner and see the sun set. Blaine said he’d drive me down half way to the bridge as he had to check in on the workers cutting down trees for firewood. On the way we get to know each other better. 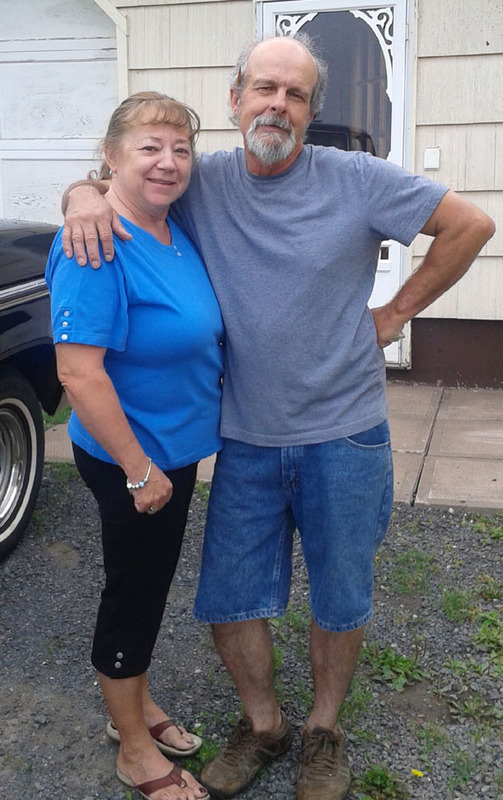 He used to help with the family business of fishing tours, and now does very well contracting work out to many teams, construction, firewood, renovations, etc. 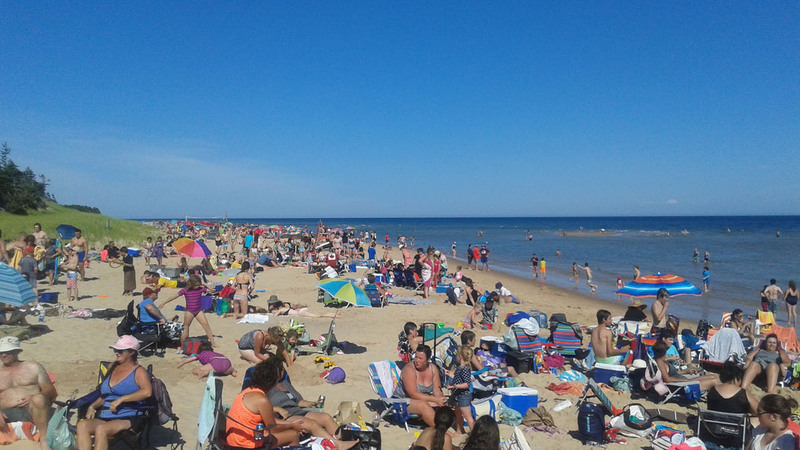 Many people on PEI heat with firewood in the winter. We drive along some back roads - Heritage Roads he says, one lane only, into where his brother is cutting down trees alone. This is dangerous, there should be 2 but the other guy didn’t show up. 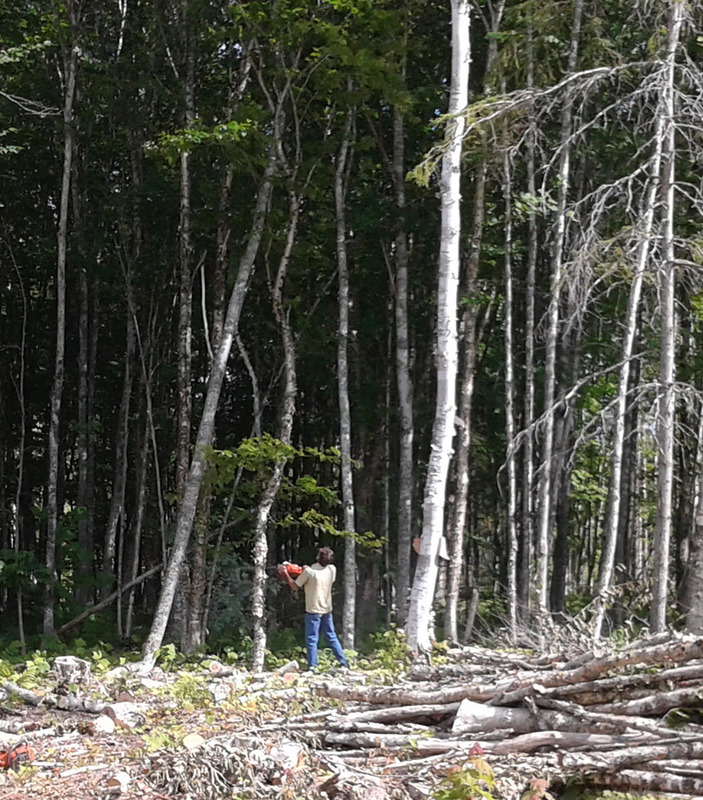 His brother is struggling with some trees that are caught up together so Blaine grabs a chain saw and quickly cuts down a few trees to help him out. Blaine then offers to drive me all the way to the bridge and says that he’ll pick up a coffee for himself and his brother and come back to help him out. 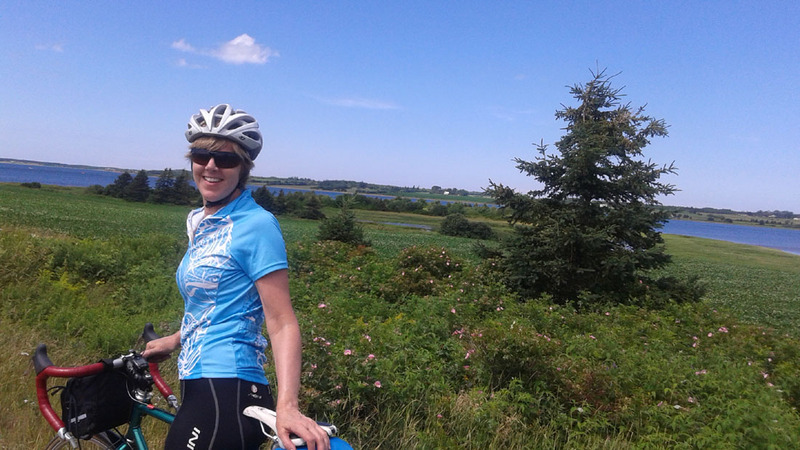 It's hard to cycle PEI with people offering to drive me! He drops me off and asks if I may come back some day? I don’t know I reply. Such a beautiful place, perhaps one day I'll return. 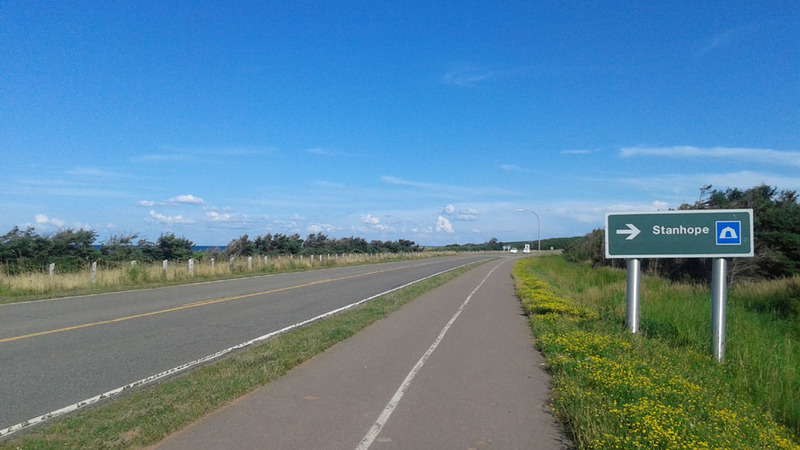 I take the shuttle bus to New Brunswick over The Confederation Bridge as bicycles aren’t allowed on it. On to Shemogue a nice 35 km ride on a quiet road along New Brunswick’s coast, to my last stop, Bill and Marilyn my Warmshowers.org hosts. When I arrive at their beautiful house and gardens they are out, but there is a note on the door, indicating where my bedroom is and to go in and have a shower if I'd like to! 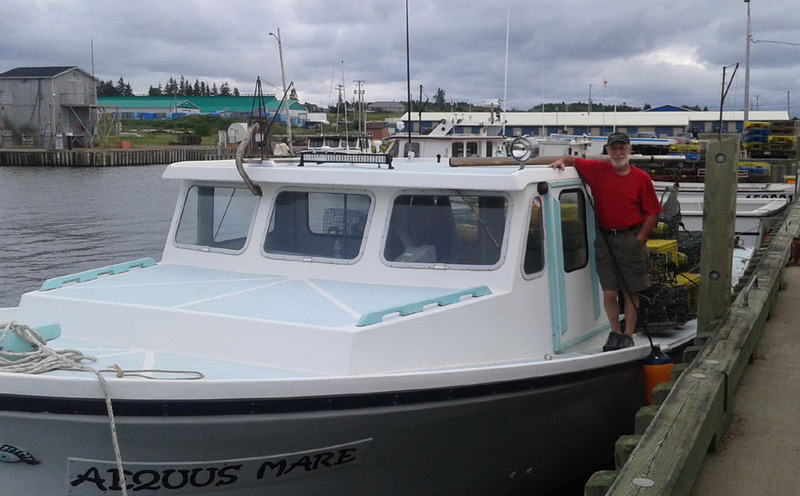 Bill takes me down to the wharf to see his boat all set to go lobster fishing on Tuesday when the season opens. He tells me all about the local fishing trade and smoking fish for export to mostly 3rd world countries. 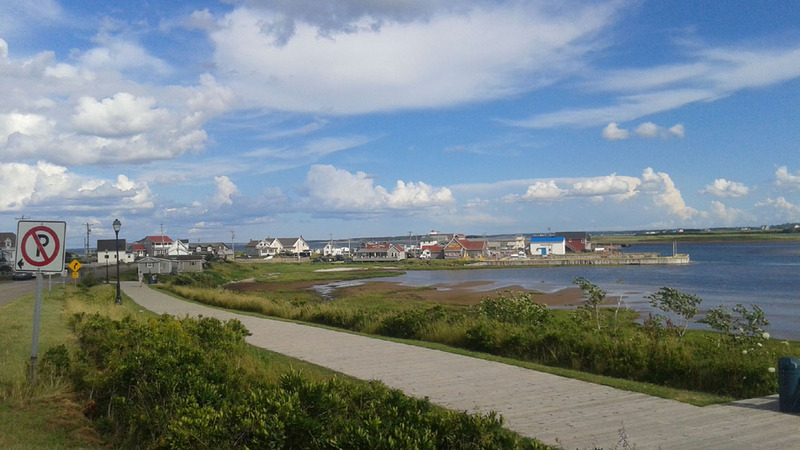 Marilyn does painting on silk and I choose a beautiful hanging of a fishing village which reminds me of North Rustico. Bill maps out the perfect quiet route to Moncton for me, avoiding the highway. It’s the first rather overcast day in over a week. I stop off along the way at a huge outdoor market in Shediac and buy a hand made necklace and earrings. I pull into the train station and board the train for Montreal. It certainly was the Best Bicycle Tour Ever! After waiting 23 years to finally follow my dream of cycle touring I am So happy to have done this. I absolutely loved cycle touring and I can’t wait to start planning the next trip! I would travel alone again in an instant. If I had been with a partner or in a group I never would have met all the people I did. I am in awe with all of the kindness and generosity from all of the people that helped me out on my trip and I am determined to do whatever I can to pay it forward and help others in any way I can from here on in.